Large numbers of the population in Tower Hamlets are not in work, and have not been in work for prolonged periods of time. This workless population is likely to belong to the poorest households in the borough and those relying most heavily on benefits. 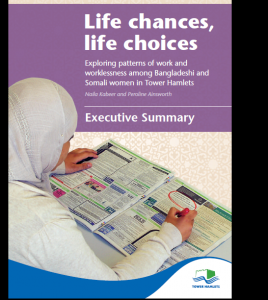 Quantitative data suggest that Bangladeshi and Somali women are disproportionately represented among this ‘workless’ group. The aim of this report is to provide detailed qualitative insights into the factors that impede as well as facilitate access to paid work among women from these two communities. There are a number of rationales for such analysis. First of all, facilitating women’s access to the labour market is likely to help reduce poverty in their households. As a corollary, it would also reduce the number of households living on benefits. And finally, barriers to women’s labour force participation within these communities represent barriers to women’s participation more broadly defined. Enabling women to engage in some form of paid work is likely to constitute the most important route through which women within these ethnic minority communities can become active citizens in the wider society in which they live. Such participation holds the key to breaking the inter-generational cycle of deprivation that has characterised the Bangladeshi community in Tower Hamlets and preventing it from developing in the more recently settled Somali community.